Our laboratories in Labege, France specialize in the research and development of delivery systems made from natural ingredients for the delivery of cosmetic actives. Submicron patented products such as Glycospheres allow a limited penetration and a protection of labile molecules. 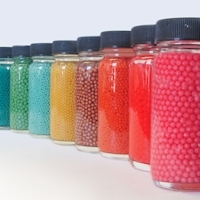 Softspheres™, another patented technology, are large and colorful visible particles, but are intended for the decoration of cosmetic products. They rub out easily, leaving no residue. 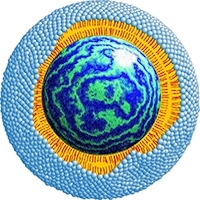 Glycospheres are supramolecular systems, which consists of a stable inner core, made of starch, and lipids layers (fatty acid esters and polar lipids), organized around this core. The small size (200 nanometers) of this spherical system allows a controlled penetration in the first layers of the epidermis. Both hydrophilic and lipopilic active ingredients can be entrapped in the Glycospheres. Experiments on ascorbic acid, free-radical scavengers, enzymes or antibacterial agents have shown that entrapped actives are more stable than the non-entrapped form, and remain active after entrapment and delivery. 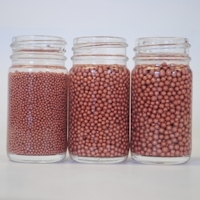 Softspheres™ are large spherical (1.00 to 2.80 mm) particles used for the decoration of formulas and the delivery of lipophilic and / or anionic active ingredients. Made of agar-agar, they are soft enough for being crushed on the skin without leaving any residue. To this agar matrix a copolymer, cationic and amphiphilic is added, which is able to trap active material (natural oils, proteins, vitamins, fragrances, …) and colorants within the sphere.